'Shoremond', the Ormond Gerald Smith estate designed by Hoppin & Koen c. 1910 on Centre Island. Click HERE and HERE for more on 'Shoremond'. Photo from Elliott Brown. A very regal exterior and well appointed interiors, unfortunately gone too soon. A later limestone pile, better designed than most newer homes, was built on part of the property and has been available for under $20M. The owner is said to display his major collection of porcelains within the home, plainly visible on the real estate listing photos. Y'all have to take a look at Archibuff's link- Le Petit Trianon or something on the shores of Long Island. Beauty is in the eye of the beholder as they say, but if it strikes your fancy, it has actually been reduced to $17.5MM. By the way, today's newspapers are full of reviews for a recently released documentary, The Queen of Versailles, about a "billionaire" couple who "came a cropper" in the midst of building their 90,000 sq. ft. dream House. It looks like a hoot. It looks as if it owes more to Margo Walker than Marie-Antoinette. Lemmie in there, I can fixit. A query about yesterday's postcards. Are such postcards of the era to be taken as true to then-life? Did publishers take opportunity/latitude to juice up surrounding this and that in order to convey atmosphere that may not have been present at the time? Curious. From the realtor's confusion as to the gender of the adjective (it should be Le Petit, not Le Petite--but at least he didn't claim it was designed by Samford White), to the four bay wide central pavilion on the ocean front, to the Holiday Inn lobby conservatory, to the uninspired reworking of the proportions of the original, to the very standard mcmansion interior openings with columns just set in--no pilasters, no frieze, no integration, 'better designed' is not the first phrase that comes to mind. Earnest good intentions maybe. Trumbauer no. Flo, I recently spent an afternoon going through a huge collection of glass postcard negatives at a local museum. They rarely juiced them up from the original sharp images (the so-called 'real photo' cards, printed directly from negative on photo paper are often among the very truest of documents), but the colorizing that too place on many of them certainly gave an amped up feeling, and blurred some of the clarity of detail. "(the so-called 'real photo' cards, printed directly from negative on photo paper are often among the very truest of documents)"
Thanks so much. I kept going back and forth between Ancient's angled view and Zach's frontal view, then HPHS's how'd-he-do-that Bing view unable to reconcile the three, finally falling back on my blissful ignorance as the only excuse I have. This master class I get to attend 5 days a week is my utter joy, thank you all for answering my questions and tolerating my runaway ADD. Isn't the Centre Island house the same one that burned several years ago just prior to completion? If memory serves (and it often does not), it was being built by a dentist then. It did indeed mysteriously burn down just weeks away from completion. The neighbors hated the bulk of the home and police suspected arson, but I dont know what the conclusion to the story was. While I hate giving them credit since they tore down Burrwood, the limestone pile's builders, Kean development, are one of the better home builders out there working on LI and have built homes on some very choice spots either on or adjacent to the former locations of Burrwood, Beacon Towers, Shoremond and coming soon to Springhill's top lot. For better or worse they have been and will be responsible for some major structures built on LI and their work is above the typical mcmansion builders achievements. Agree grudgingly on Kean...though they really destroyed the interiors of The Pebbles in Oyster Bay Cove. "If it's gotta be a McMansion, make it a Kean!" Perhaps this is semantics but I always thought the term 'McMansion' applied to smaller houses that were very clearly, and poorly, attempting to be larger, fancier houses (think Roslyn Heights). Kean seems to build very large and elaborate houses...not the smaller knock-offs...so wouldn't his simply be mansions? Agree, Kean's forte is building mostly very large, well constructed, well appointed mansion sized homes. Their body of work really isnt so bad, but you didnt hear that from me. It could be a lot worse. In fact, if you compare it with the houses that wind up in the Frontgate catalog, it's quite wonderful. Sure, a great architect could have taken the general scheme and added subtlety and refinement -- and driven up the cost by 20%. But for what it is, it's not bad at all. Ancient...that one is actually on Cove Road in Oyster Bay. "It could be a lot worse." Zach, here is your new OLI subtitle. Wait...I'm confused. Was Le Petit Trianon the mansion you all speak of that was burned prior to completion? Though I'm not sure how I feel about the estate, it does not look as if it were damaged in anyway. I also agree about Kean, but why couldn't they keep the exisiting mansion and use it in another way and build around it? I'm getting more forgetful by the day. P.S. If that Dock Hollow Rd house sells for the asking price, I'm going to reassess everything I think I know about real estate. Another question about Kean. Though the homes they build are appealing enough, what are the actual materials? Are they built of real wood,marble,limestone,and brick or is it all an illusion and built of plywood, resin,pressed board, and I dont know the term, but that sort of sprayed syrofoam that appears to be stucco? "I also agree about Kean, but why couldn't they keep the exisiting mansion and use it in another way and build around it?" Kean is about buying the neighborhood, selling the lot[-s], designing the house, designing the exterior and interior details, building the house, decorating the house, landscaping the house.....what would be their interest in restoration at any on these levels? Posters sometimes ask why the big old houses we look at were so often abandoned after World War Two. Excerpt: The executive who feels, as apparently Robert R. Young does, that to be completely happy he needs a forty-room "cottage" in Newport and a thirty-one-room oceanside villa in Palm Beach is a rare bird these days. 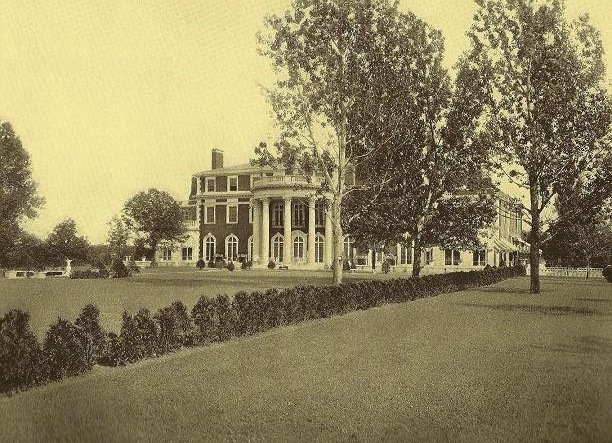 The fact that Young paid only $38,000 for his Newport place, Fairholme, which cost Philadelphia banker John R. Drexel nearly a quarter of a million dollars to build in 1905, demonstrates the decline in the market for such outsize mansions. The pseudo Petit Trianon i(called Twinight) s on a lot that encompasses part of the walled western partere garden of Shoremond. The building burned just as it was being completed in 1999. Workers supposedly left solvent / oil soaked rags which combusted. The house did mot have a working alarm system, and Centre Island has no fire hydrants. The builder was Richard Cohen, member of a then prominent NY commercial real estate family and owner of a company that makes specialuzed valves (dairy queen soft serve nozzles). Much larger than the original Petit Trianon on a site that is about 5% of the Shoremond original estate, the building appears institutional and monolithic. The interiors are poor imitations of the original at best with few if any appropriate details. It would have cost 10x the price if the home was built with the same attention to detail as was Shoremond. I expect David Eastin would advise tearing it down and building a much finer, smaller, more site appropraite home.